(Phys.org)—Researchers have fabricated a silicon optical antenna that is somewhat like an extremely small, special kind of prism. This is because when a red light shines on the optical antenna, the light turns right, but when the light is another color such as orange, it turns left. 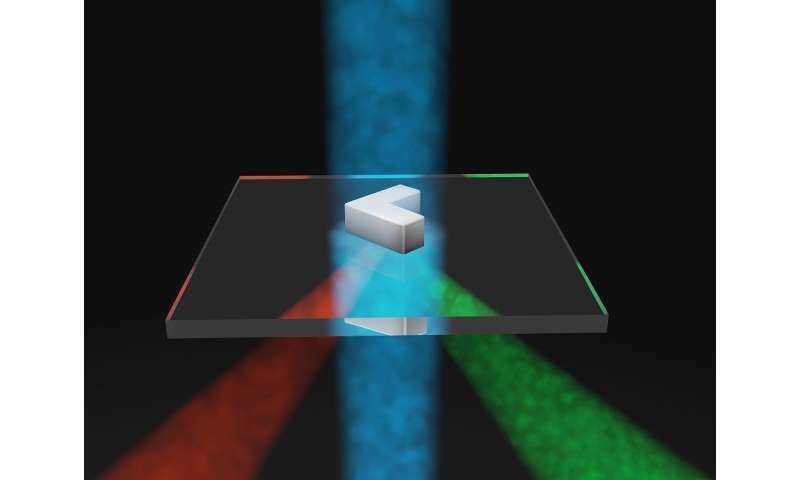 This unusual property, which is called "bidirectional color scattering," enables the optical antenna to function effectively as a passive wavelength router for visible light. The device could have applications for innovative light sensors, light-matter manipulation, and optical communication. The new optical antenna was developed by a team of researchers, Jiaqi Li et al., at imec (Interuniversity MicroElectronics Center) and the University of Leuven (KU Leuven), both in Leuven, Belgium. Their work is published in a recent issue of Nano Letters. Although optical antennas are a relatively new area of research, they are simply the optical version of the radio and microwave antennas that most people are familiar with, which are commonly used for receiving and transmitting signals in radios, cell phones, and Wi-Fi. In general, an antenna's size corresponds to the wavelengths that it was designed for. Since radio and microwave waves are on the scale of millimeters to kilometers, these antennas can be quite large. Since the wavelength of visible light is on the scale of a few hundred nanometers, tuning in to these signals requires nanosized antennas, which are much more difficult to fabricate. Over the past few years, the imec and KU Leuven team has been exploring the possibilities of directional light manipulation at these length scales using an antenna consisting of just a single element. In 2013, using gold nanoantennas, they were able to demonstrate the world's smallest unidirectional optical antenna, in the shape of the letter V. These metallic antennas support so-called "plasmonic modes," which are fundamentally different form the optical modes supported by a dielectric antenna. 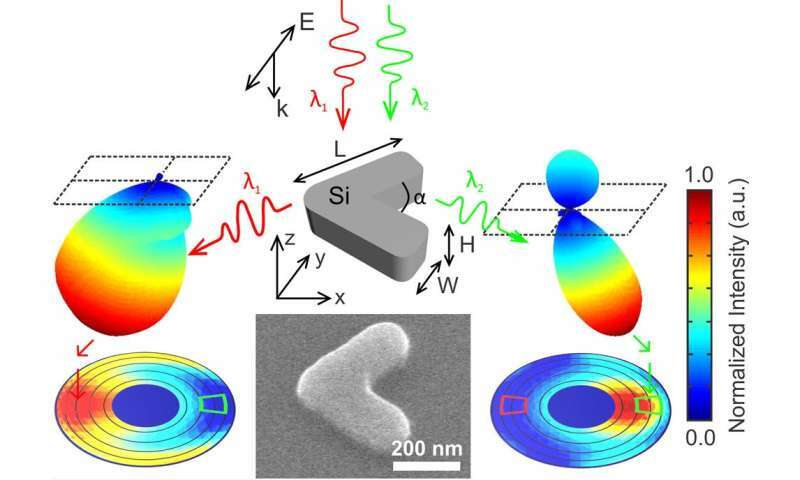 Now, by switching to a dielectric V-shaped antenna made from silicon, the researchers could achieve bidirectional scattering, in contrast to unidirectional scattering in the case of using gold. In bidirectional scattering, the scattering direction depends on the wavelength of the incoming (incident) light. The shift in direction is gradual. For example, as the wavelength decreases from 755 nm to 660 nm, the scattering direction gradually changes from the leftward to the rightward direction. The specific wavelengths can be tuned by engineering slight adjustments to the size and shape of the antenna. "With our work, we demonstrate that by carefully engineering the geometry of a single piece of silicon with dimensions smaller than the light wavelength, it is possible to efficiently direct visible and near-infrared light of different colors into different directions," coauthor Niels Verellen, a physicist at imec and KU Leuven, told Phys.org. "This, for instance, was not possible with just symmetric particles or similarly shaped metallic (plasmonic) antennas." Using silicon offers several advantages compared to using gold. For instance, silicon circumvents Ohmic absorption losses, which is one of the main drawbacks of plasmonic nanoantennas. In addition, the silicon antennas have a large scattering cross-section, which means they can interact with light very efficiently. Silicon is also a fully CMOS-compatible material, allowing straightforward integration in large-scale opto-electronic device fabrication. "Our very small silicon optical antennas are approaching the limits of how small a functional optical component can be," Li said. "They constitute a bridge between the macroscale optics most people are very familiar with, and the micro and nanoscale of modern-day electronics, and even the molecular and atomic scale." When investigating the underlying physics of the bidirectional scattering, the researchers found that the bidirectional effect arises from interference among all of the various electromagnetic modes supported by the antenna. All of the antenna's electric and magnetic modes scatter incident light at distinct angles and patterns, and the final pattern can be described as the combination of all of these modes, or multipoles. By decomposing this total scattering pattern, the researchers could determine which multipoles dominate the scattering. It turns out that the simultaneous excitation of two of the dominant multipoles (a magnetic dipole and an electric quadrupole) is only possible in the asymmetrically shaped antenna, emphasizing the importance of the antenna geometry. In terms of applications, the bidirectional optical antenna could be used to make more compact, cheaper, and more efficient devices for measuring light, such as optical sensors and photodetectors. These devices are used in a variety of areas, including the life sciences, photovoltaics, optical fibers, environmental monitoring, LIDAR, holography, and quantum computing. The researchers plan to explore these applications and many others in the future. "Dielectric antennas form promising building blocks with a very small footprint for microscopic or nanosized optical systems," Verellen said. "Selectively sending or receiving photons in or from certain directions is important in this field. For example, in photonic integrated circuits (PIC), grating couplers are used to launch light coming from a laser or optical fiber into a waveguide on the chip. These grating couplers are relatively large components, several wavelengths in size, which can potentially be replaced by one or a few directional optical antennas. "Especially in nanophotonics applications where every photon counts, one immediately benefits from directed photon routing (wavefront engineering) for efficient photon collection—think, for instance, of Raman spectroscopy and quantum optics. Light routing can, for example, be used to transmit signals or increase the signal-to-noise ratio of a detector. "Wavelength-dependent directivity is also promising for scaling light-based sensors (e.g., biological or chemical). Sensors are often based on the detection of changes in the spectrum of light coming from a sample, such as scattered, transmitted or fluorescent light. Evaluating the spectral information is done by gratings or filters. These components are large and hard to miniaturize. If the spectral information would already be present in the scattering or emission patterns coming from a directional optical antenna placed in close proximity to the sample, this could simplify spectral analysis, which could result in cheaper and more compact devices." In future research, the scientists plan to investigate how the new optical antenna handles light from a very small light source, such as a quantum dot. They also want to explore actively manipulating the light. "Currently, the functionality of the silicon antenna is passive," Li said. "This means that, once fabricated, the antenna will always route the same colors in the same directions. However, we could give the antenna a little motivational boost and make it active by modulating its optical properties. By applying some external cue, we can then basically tell the antenna which color we want to direct in which direction." This is one of the causes of the background red shift.